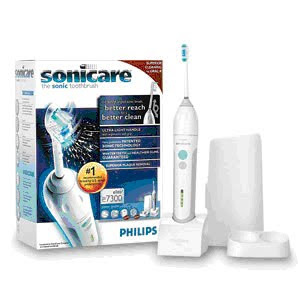 Electric toothbrushes are superior to ordinary manual toothbrushes in every aspect. Electric toothbrushes have high powered bristles that dislodges more plaque faster and more thoroughly than manual toothbrushes. The electric toothbrush cleans away more plaque in two minutes compared to manual brushing in 6 minutes. Switching to an electric toothbrush can help prevent tooth and gum diseases such as cavities and gingivitis. With high speed cleaning and complex designs, electric toothbrushes are capable of conquering areas that are normally hard to reach as behind the molars and near the gum line. Electric toothbrushes are also great for people who face dexterity problems or other illnesses which affect motor skills such as arthritis and rheumatism. I recommend Sonicare and that is what we sell in our office. We also have the the children’s version, which is easy and fun for the kids to use and much better at cleaning their little mouths. My girls love theirs! Clinical tests and surveys have proven electric toothbrushes to be indispensable hygiene devices. The American Dental Association published positive survey results for 16,000 patients who were asked to replace manual brushing with mechanical brushing. More than 80 percent of the patients reported improved oral cleanliness with the switch from manual to powered brushing. Some people are too used to the old mode of cleaning and may not switch to an electric toothbrush. However, it is undeniable that most individuals fare better on electric toothbrushes. Electric toothbrushes allows them to clear more plaque in a shorter span of time which is especially beneficial for people who find brushing a chore. With manual toothbrushes, you will have to throw out the entire toothbrush once its lifespan is up. Whereas with electric toothbrushes, most of them come with rechargeable systems which only require you to change the brush head. Since electric toothbrushes produce less plastic waste and are becoming more affordable these days, electric toothbrushes are catching on as a popular life enhancing device for everyone. Ask about our Sonicare toothbrushes and for a demonstration on how they work at your next cleaning. This the excellent post which I have seen and it helped me a lot , Thanks for sharing it! !